To the north of both Cairns and the Atherton Tableland is the Daintree River, which gives the area and the small town its name. 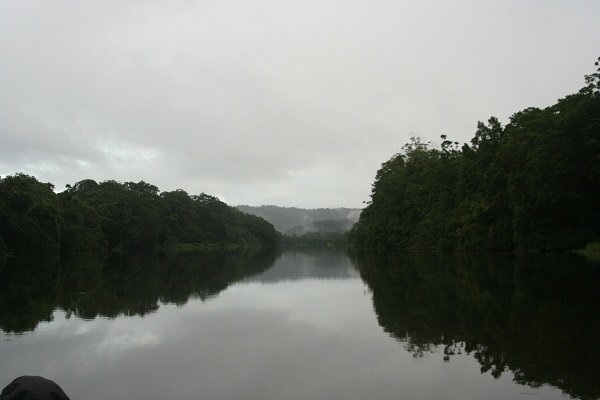 The Daintree River is popular with tourists for river cruises to look for saltwater crocodiles, and for birders to look for a few choice rarities in this tidal river (not to mention crocodiles if no birds are present). So one morning I got up from bed very early to drive to the Daintree at dawn. Very early. As I approached the town through fields of sugar cane the car was drenched by squally showers, leaving me slightly nervous. In reading up on Daintree trips I had learnt that as a birder I should go on the bird speciality trips, these leave earlier in the morning than the croc ones, and they are on open top boats to give clearer views of flying birds. It was this latter point that was causing me some concern as I slowed down in worsening visibility on the approach. I parked my car and met the guide, who assured me cheerfully in the grey morning that the worst of the rain was over according to the weather radar. The assembled birders took their seats on the little cruiser and set off into the misty morning. We weren’t long waiting for birds, almost immediately a Black Bittern, one of the specialities of the trip, flew over the boat, along with a few Torresian Imperial-pigeons. We ducked into a small cove in the side of the river and quickly found a range of interesting birds, including the Shining Flycatcher, a coastal specialist found across the north of Australia, and an Azure Kingfisher, a small but bright little bird in the gloom of the morning. We then saw another speciality of the area, a juvenile Great-billed Heron. This species occurs from Australia up to South East Asia, but is common nowhere and the Daintree is one of the best places to see this massive heron. As you can see from my photo, however, the light wasn’t really doing us any favours. Great-billed Heron. Can’t you tell? It was at this point that the rain began again. We all had ponchos to keep the rain off our bodies, but the sustained and inescapable rain still managed to penetrate these after a while. Still, we did manage to find some other impressive waterbirds, including Royal Spoonbills, Great Egrets, Striated Herons, Nankeen Night-herons (quite a good location for members of that family actually), Great Cormorants, Green Pygmy Geese and Australasian Darters. Smaller birds were present too, including Brown-backed Honeyeaters and White-breasted Woodswallows. As the rain picked up we managed to find a pair of raptors, a White-bellied Sea-eagle and a Whistling Kite. This was the point where I must admit, however, where I was rapidly losing interest. Of course, even if you ignore the cold and damp sensation of heavy rain the fact is that I simply can’t see very much in heavy rain. My glasses fog up and are spotted with rain, my binculars share a similar fate, and I run out of dry cloth to wipe them down with. I enjoy birding generally but not under those circumstances. I am not a rain person. The final bit of the cruise was down a long tributary to find the nest of a Papuan Frogmouth. I managed to dry my glasses enough to look up at this damp looking log of a bird before giving up entirely (I was lucky enough to see another one in more agreeable circumstances a day later). On the ride back the rain finally stopped, but too late, and I was too blinded to look for the Yellow Oriole I heard. A Daintree trip can be a very rewarding way to see waterbirds in Queensland, and most people that go on them get good photos and have a great time. I’d recommend it for people, and hope that if you do go on it you have a better time than I did! This was another one of the stops on my trip last year – the birding on this river is pretty spectacular and the guide (if you went on the same very early morning trip I did) was excellent. I really enjoyed my visit to Daintree. 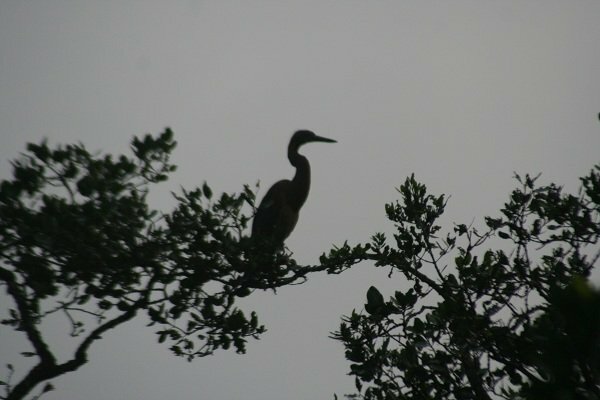 I went out on the river twice, once in the afternoon and once in the morning with some other birders. We saw a Great-billed Heron on the nest, half-grown Black Bittern chicks in their nests, and gorgeous Azure and Sacred Kingfishers and despite the threatening clouds, didn’t get wet at all. Did you visit the rain forest at all or just the river? The rain forest was amazing even if no cassowary showed itself to me. Where Are You Birding This Second Weekend of November 2017?